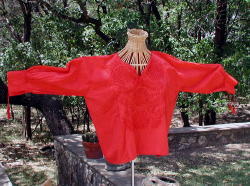 A truly classic Mexican peasant blouse, this entirely handmade and embroidered (including the seams) Chiapas blouse embodies all those great 60’s memories. I have tried to include as many close-ups as possible so that you can see this incredible work. It is white on white. 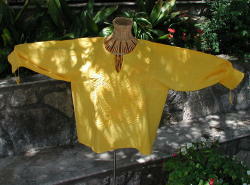 The blouses are shown on a medium for form. 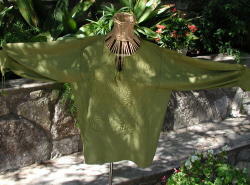 This blouse has an inset kimono sleeve, so is quite comfortable. 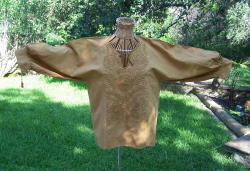 It is cut square, meaning the bust and hips are the same size, so please take that into consideration when ordering one of these blouses. There is a photo explanation of how to measure on the main clothing page. Examples One of my customers has a 38DD bust. She needed a 50" Chiapas to get the correct fit. That means her "actual" measurement was probably 45"-46". Another customer came to try things on, and found that even though she thought she wanted a 40" or 42", she actually bought all 44"s. She had a 38" bust. 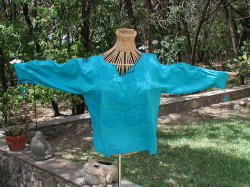 The blouses average between 23" to 25" long. The ALL WHITE blouses have moved to their own page. unpredictable. Therefore, ALL Chiapas left are $30 each. Enjoy!! New batch has a more green/brown color.